Edwin O’Brien was born in New York on April 8, 1939. After studying philosophy and theology at the major seminary, he was ordained a priest for the Archdiocese of New York on May 29, 1965. His pastoral duties were varied, first in his diocese, and later as a military chaplain even to the point of parachuting into Vietnam during the war to attend the spiritual needs of the soldiers. Later, in Rome, he obtained a doctorate in moral theology at the University of St. Thomas Aquinas, before returning to the Archdiocese of New York, where he held several important positions: vice chancellor, director of communications and private secretary of the Archbishop. He then dedicated himself to the formation of future priests, first as rector of St. Joseph Seminary in Yonkers, then, from 1990 to 1994, as rector of the Pontifical North American College in Rome. On February 6, 1996, St. John Paul II appointed him auxiliary bishop of New York. Cardinal John Joseph O’Connor, then Archbishop of New York, conferred the fullness of the sacrament of Holy Orders upon him, inserting him into the Episcopal College, on March 25, during the feast of the Annunciation. A year later he was appointed Military Ordinary Archbishop for the United States of America, a position he held for ten years before being appointed Archbishop of Baltimore, the first diocese founded in the United States of America, on July 12, 2007. His episcopal motto – Pastores Dabo Vobis – illustrates both his commitment in favor of priestly vocations and his intention to exercise his ministry in the field, in contact with God’s people, like the Good Shepherd. On August 29, 2011, Benedict XVI called him to Rome as pro-Grand Master of the Equestrian Order of the Holy Sepulchre of Jerusalem, creating him Cardinal on February 18, 2012, with the title of Cardinal Deacon of San Sebastiano al Palatino. 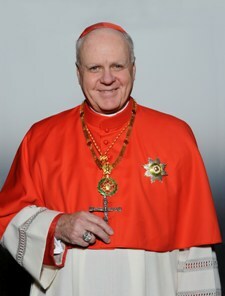 On March 15, 2012, a few weeks after his creation as cardinal, the Pope officially conferred on him the office of Grand Master of the Order. Cardinal O’Brien is also a member of the Congregations for Oriental Churches, for Catholic Education, and for the Cause of Saints, as well as the Pontifical Councils for Justice and Peace, and Cor Unum.